The 22' Super Water Slide is our LONGEST and HIGHEST water slide! 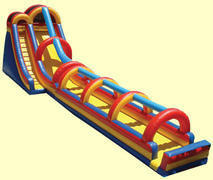 Truly living up to its name, the 22' Super Water Slide will make your party or special event a memorable one! The 22' Super Water Slide stands two stories high and will thrill riders of all ages. CAPACITY: 200+ riders per hour. An adult must be present at all times while unit is in use. ELECTRICAL: Requires (3) 10-15amp outlet (Note: will not work on GFI outlet).